These are not your run-of-the-mill crafts! I'll tell you how I find inspiration in art and design and take it to a whole nother level. Then I'll show how you can use that inspiration to make your own cool DIY projects on a dime. Watch me on The Nate Berkus Show, Monday, December 12, 2011. Check your local listings for the exact time. I'll post detailed step by step instructions for those projects and more on my blog. Subscribe to the Relevé Design blog or follow me on Twitter and Facebook so you don't miss a single project. 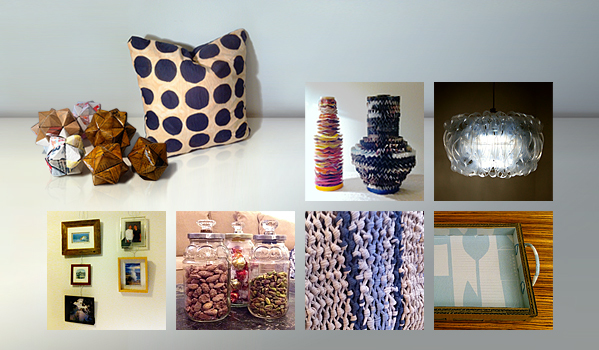 Here are the projects featured on the show. I'll post video and photo tutorials and link to them below as they are completed. For text instructions visit The Nate Berkus Show website. Congratulations!- I will be on the lookout for this. Thanks! Hopefully, you’ll like the projects as much I enjoyed making them! I just watched you on the Nate Show and was very inspired to attempt some of your creations! I was going to try to make the origami things, but I am getting a little confused! Have you ever thought about posting a couple pictures at different steps of your projects? I totally agree instructions can be really confusing without pictures, especially origami! I’m working on step by step instructions with videos and pictures. And since you asked…I’ll do the origami accessories next, just for you! And thanks for the feedback. If you get confused with any steps submit a comment or send me a note. Hi Bao! I came to your website after seeing you on Nate also, and was so happy to see your post to Stacy. I have my little triangles folded, but the glueing part is a little puzzling. I’m looking forward to your video and pictures detailing the process. I really love the varnished paper bag balls, but look forward to experimenting with turning other trash paper into treasure. Hi, Barb! Thanks for watching, and thanks for visiting! I’m glad you’re here! Origami is notoriously confusing even with diagrams! Seriously. I’m SO IMPRESSED you got so far with just text instructions! KUDOS to you! The origami accessories will be the next video tutorial I film. So stay tuned. Also, if there are any other projects you want to be bumped up go vote on the “Upcoming HOW TOs” (http://www.relevedesign.com/?page_id=567). I’m so glad you like the shellacked accessories. They are probably my favorite versions. They help warm up a space. I have them sitting on a shelve in my bedroom. For the shellacked ones on the show I actually used the weekly circulars from a grocery store. But you are right. There are so many things you can make them out of. I’m going to do phone books next. The yellow paper should be really nice. All that wrapping paper from your Christmas presents this year, can be turned into next year’s Christmas ornaments. They would be so chic on a Christmas tree or strung on some string and used as a garland. It was my first time on TV! Thanks, again for watching, Barb! Hello – I watched the show this morning and am very eager to get started on some dresss shirt throw pillows and the cardboard tray. I wish there was a video of how to the cardboard tray as it seems more complex – but I am going to just jump in and try it. Very clever. HGTV ought to give you your own show! Hi, Jeannie! Thanks for watching the show! Oh gosh, I know it can sound complex, especially when all there is to go by is text. I’m writing and shooting video tutorials for all the projects based on the number of votes they get. Cast your votes if you haven’t already! I love your gumption and ‘can do’ attitude! I’m going to whip up some pics and diagrams to help you on your way. And you can always send me a note directly, or ask me questions in the comments section. I’ll definitely take an HGTV show, if you want to give me one! LOL 😀 Thanks, again, Jeanie! I LOVE the t-shirt throw, and the Chandy! I enjoyed watching you on the Nate show today! Thanks, Gail! I’m sooo happy you enjoyed the show! 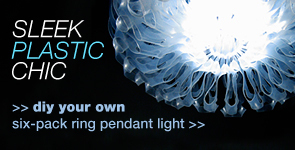 I have video tutorial for the pendant light in the blog already. If you start doing the throw and have any questions feel free to send me a note. Hi! Just saw your designs on the Nate show and can’t wait to try them! I’m going to do the (spaghetti sauce) jar as soon as I get offline. We’ll start collecting soda rings this weekend, as well as tell our friends to save theirs for us. Congrats on a successful show, it was great! Hey Lija! That’s cool! Take some pictures. I’d love to see how they turn out! What do you plan to put in the jars? You might be able to get six-pack rings from you local convenient store as well. A lot of convenient stores, corner deli’s, and grocery stores get their soda cans shipped to them in six-packs. If you start up a conversation and get in good with a stock person, you might be able to collect your 60 rings in no time. Also, 60 rings is just my recommended number. I chose that number, because I like the pendant light more dense which gives the shape more definition. You can put your pendant light together even if you don’t have all 60. As you get more just unsnap the rim and and them on. You can try using 40, 32, 24, or even less. Just experiment. Of course the less rings you use, more light will shine through, and you might start seeing the light bulb peeking through. Feel free to comment or send me a note if you have any questions. WOW! I loved watching your segment on the Nate Berkus show today! I am always searching for creative and “upcycling” projects that are inexpensive. I will be doing ALL of the projects shown today and will now be following your blog! I have a 70s kitchen that has lime green swirled counter tops, dark cabinets and yellow flooring that I’m trying to work with, so i will be on the look out for any kitchen ideas! Wowsers, Holly! Thanks for watching! Well, you’ve come to the right place for inexpensive projects. I try not to spend a dime on anything in a project unless I really, really have to. Make sure to subscribe to the blog and check back. I’ll be posting video tutorials and photos so that the instructions will be easier to follow. OOO…LIME GREEN, DARK CABINETS, AND YELLOW FLOORS!? Sounds like you got some retro cool on your hands. I have friends who have a vintage mint green and pink kitchen – all original cabinetry and appliances! It’s totally amazing. They really don’t make kitchens like that anymore! I begged them not to renovate. Are you looking for input on color? Personally, I think your kitchen sounds nice and cheerful, though I might be tempted to lighten the dark cabinets. When you put a dark color next to a light color kick up each other’s intensity. But if all your colors are at the same value they can calm down a little bit. Are you thinking you need to tone down the kitchen or play it up? Here’s some Relevé Design style homework you. Go to your local library and check out some books on painters (They are truly masters of color! ), especially Impressionists. Find paintings that you really like that has both your green and yellow. Take notice of what other colors they use in the painting to guide you to other colors that could work in your space. And I’m sure you hear this ALL THE TIME, but try switching out the hardware, if you want to do a quick update. It really does work! I watched the Nate show earlier today, and can’t wait to get started on these projects…especially the pendant lamp which is so ingenious and also beautiful. I like that 90%- 100% of the products you use are recycled materials. I have found alot of designers say it is “recycled” but only one tiny portion is actually recycled materials. I almost have enough 6 pack rings to start my lamp…I was saving them for a 3D snowflake design that I came across, but your lamps will fit in my bedroom perfectly! Thanks again! Oh yeah, I try to get as much of my material out of the trash as possible. Theresa, actually, you’ll do even better than “recycle”! You’ll be UPCYCLING. Check out this page (http://www.relevedesign.com/?page_id=12) see what I mean. OH WOW! GOSH! That is soooo cool that you almost have all the six-pack rings! Write a comment or send me a note if you have any questions. Please take pictures. I wanna see how it turns out! Loved you on the show today! I am so excited to see your how to on the macramé throw! I’m totally a visual learner so I will eagerly be waiting on the step by step video! Hoping to complete one for Christmas as a gift for my sister! By the way… YOU AMAZE ME!! Hi, Norma! Thanks for watching! I’m totally right there with you about the visual learning thing. I’ll try to put up pictures for you soon, so you can work get it done for Christmas! In the mean time, save up your t-shirts. A proper throw will need A LOT of t-shirts! You might consider different textiles as well, but it will change the texture of your throw. That can be OK. You’ll just have to figure out a color and texture pattern that will work for you. As I mentioned on the show, it’s a project that you start and you can keep adding onto for years, by tying more t-shirts on as you get them. You know how some sentimental quilts are made with swatches of cloth from clothes and baby blankets? Well, this throw has that same potential, but it’s a bit more subtle. I was looking so forward to starting one of these throws today but the instructions have me somewhat confused. I am with Norma; would love to do one before Christmas and need a visual to get started. Love all your ideas and totally enjoyed watching you on Nate’s show. The text-only instructions can be a doozy! I know! Don’t fret. I’m working on a video tutorial for you, and I’ll post it ASAP. I’ll email you a couple pictures so you can get started! I want you and Norma to make your X-mas deadline! Thanks for watching, Mickey! Tell Norma I said hello! Thanks so much….you are not only incredibly innovative but you are so wonderfully personable….I am your new biggest fan!!! GOSH! I’m honored! I hope the drawings I sent you are intelligible. Just hit me up again if you need more help. In the meantime I’m hitting the video cam! So stay tuned! I think you are officially awesome! But, I’m sure you know that already! 🙂 I loved ALL your projects shown on the Nate show, (Congrats btw) You just gave my husband a reason to drink more beer! LOL! I have everyone saving the six pack plastics now, and I can’t wait. 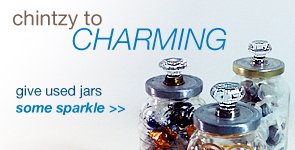 I’m a fantatic about saving jars, and now thanks to you, I can make them fancy! Thank you so much for posting your work. I hope this shows people how easy it is to recycle and reuse. Just look how beautiful you made them! Kim you are too kind! And thanks for watching! If your husband ever gets tired of beer, as I told Lija earlier, you might be able to meet your six-pack ring quota faster, if you get in the good graces of a stock person at a grocery or convenient store. They might give you their discarded six-pack rings. Also, you don’t have to use 60. You can use less if you want. I’ll make sure to update that post with those tips. I’m a jar fanatic too! I can’t wait for you to have fancy jars! Take pictures. I wanna see! Kim, thanks for watching, visiting, commenting, and sharing. Relevé Design is around, because of you all keep me going! WOW!WOW!WOW! I just caught you on The Nate Show. I am making EVERYTHING!! (just as soon as I get Christmas over with 🙂 ) hmmmm…t-shirts first, then the origami, then ???? I’ve subscribed to your blog so I won’t miss anything, thanks for sharing your fabulous designs! WHOA!WHOA!WHOA! Thanks for watching me on the show, June! If you do the origami accessories first you can use the paper from your unwrapped Christmas presents. I’ll try to film that video before Christmas so you’ll have it. Wow, I finally watched the recorded Nate episode tonight and I just love all of your projects. 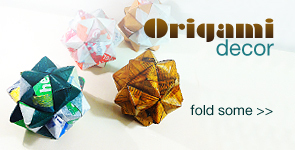 I am eager to try the origami balls, they are beautiful. I thought all of your projects were amazing and I can’t wait to get started. I am about to become a subscriber so that I don’t miss aything. Thanks for watching Denise! I’m so glad you like the projects. The origami balls are one of my favorite projects, cause they are so easy, and you can do them with friends and family. What kind of paper do you think you’ll use? If you make some, send me a picture through the “Show and tell” page. I’d love to see! There are more projects in the works, and you can vote on which project gets a tutorial next. Just cast a vote on the “Upcoming HOW TOs” page. Again, THANK YOU SO MUCH for watching and for writing me, Denise! I just loved your items on the Nate Berkus Show. I had a vacation day and so glad I watched. Can you send the directions for the decorative glass jars? I want to make this with our Scouting group. The kid’s parents will love it. Hi Judy. I’m so honored that you spent part of your valuable vacation day watching me! I only have written instructions which are on Nate’s website at the moment. BUT! Leigh of “frankly living” made a tutorial of my project that I have to admit is pretty good. Between those two sites you should be able to do the project. I’ll have my own video tutorial for it soon! Don’t hesitate to send me a note or write another comment if you have any questions at all. I hope you and your scouting group have fun with the project! Thanks for watching and for writing to me! matter, made me individually imagine it from a lot of various angles.